AKSIOMA : Jurnal Matematika dan Pendidikan Matematika dengan nomor ISSN 2086-2725 (Print), ISSN 2579-7646 (Online) adalah jurnal dalam bidang matematika dan pendidikan matematika yang memfasilitasi guru, mahasiswa, dosen, dan praktisi pendidikan dalam menerbitkan karya ilmiah atau artikel hasil penelitian maupun studi pustaka. Jurnal Aksioma ini terbit 2 kali dalam setahun yaitu pada bulan Juli dan Desember. The AKSIOMA is the first academic journal in this field published in Mathematics Education Department at Universitas PGRI Semarang. This exciting new journal has generated great enthusiasm among Indonesian scholars and is considered a long overdue development in the field. The journal is an international forum for the publication of original articles written in a variety of styles, including research investigations using experimental, qualitative, ethnographic, historical, philosophical, or case study approaches; critical reviews of the literature; policy perspectives; and position papers, curriculum arguments, and discussion of issues in teacher education. 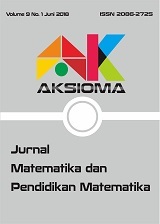 AKSIOMA : Jurnal Matematika dan Pendidikan Matematika is licensed under a Creative Commons Attribution-ShareAlike 4.0 International License.